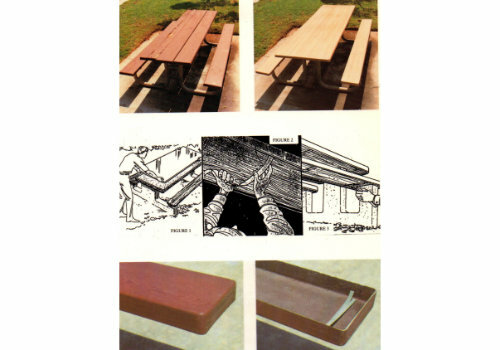 Our fiberglass table top covers give new life to worn picnic tables at a fraction of the cost for new ones. Table and bench covers are a one piece fiberglass shell with resin bonded 1/2″ stainless steel straps for covering over existing wood furniture. Installation is fast and easy and eliminates the need for sanding, repainting and all other maintenance required of wood. Field tested and approved by the US Forest Service for camp and park sites, our Redwood City cover is a simulated woodgrain finish that has the look of real wood without the problems of warping, splintering and dry rot.